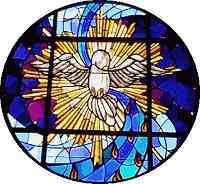 Come Holy Spirit and fill the hearts of the faithful, and kindle in them the fire of divine love. Send forth Your Spirit and renew the face of the earth. Before the great multitude of heavenly witnesses, I offer myself, soul and body to You, Eternal Spirit of God. I adore the brightness of Your purity, the unerring righteousness of Your justice, and the unconditional nature of Your love. You are the strength and light of my soul. In You I live and move and have my being. I desire never to grieve You by unfaithfulness, and I pray with all my heart for help in avoiding even the smallest sin against You. Mercifully guard my every thought and grant that I may always watch for Your light, listen to Your voice, and follow Your inspirations. I cling to You and give myself to You and ask You by Your compassion to watch over me in my weakness. I implore You, Adorable Spirit, helper of my infirmity, to keep me always in Your grace. Give me grace O Holy Spirit, Spirit of the Father and the Son, to say to You always and everywhere, “Speak Lord for Your servant is listening.” Amen. O Lord Jesus Christ, before ascending into heaven You promised to send us the Holy Spirit to finish Your work upon the Earth. Grant the same Holy Spirit to me so that my soul may be sanctified and grow in the works of Your grace and Your love. Grant me the Spirit of Wisdom, that I may despise the perishable things of this world and aspire only after the things that are eternal; the Spirit of Understanding, to enlighten my mind with the light of Your divine truth; the Spirit of Counsel, that I may always choose the surest way of pleasing God and gaining heaven; the Spirit of Fortitude, that I may bear my cross with You and that I may overcome with courage all the obstacles that oppose my salvation; the Spirit of Knowledge, that I may know God and know myself and grow in holiness; the Spirit of Piety, that I may find the service of God sweet and enjoyable, and the Spirit of Fear of the Lord, that I may be filled with a loving reverence towards God and may dread displeasing Him in any way. Help me, dear Lord, to be one of Your true disciples, and animate me in all things with Your Spirit. Amen. Almighty and eternal God, You have restored me into your image and likeness by the water of baptism and the Holy Spirit, and You gave me the forgiveness of all sin. Send forth from heaven upon me your sevenfold Spirit: Fill me with the Spirit of Wisdom and Understanding, the Spirit of Counsel and Fortitude, the Spirit of Knowledge and Piety, and the Spirit of Holy Fear. Help me to come alive in all these gifts, that I may be purified, turn away from all evil, and serve Your kingdom well. Amen. Come and fill me, O Spirit of Wisdom, and reveal to my soul the mysteries of heavenly things, in their exceeding greatness, power and beauty. Teach me to love them above and beyond all the passing joys and satisfactions of earth and to prefer Your wisdom over the so-called wisdom of this world. Help me to grow in Your wisdom, especially during temptations, trials, and all the daily challenges that I face. Amen. Come and fill me, O Spirit of Understanding, and enlighten my mind, that I may accept and believe the mysteries of salvation and the truths of Your kingdom in order to stay on the path to heaven and serve Your kingdom in my daily life. Help me to discern what is evil, and enlighten me so that I may be holy here on earth and live forever in the light of Your glory with a clear vision of You and the Father and the Son. Amen. Come and fill me, O Spirit of Counsel. Help me and guide me in all my ways, that I may always do Your holy will. Incline my heart to prefer only what is good; turn it away from all that is evil, and direct me by the straight path of Your commandments to that goal of eternal life for which I long. Amen. Come and fill me, O Blessed Spirit of Fortitude. Protect my soul in times of trouble and adversity. Sustain my efforts in holiness, strengthen me in my weakness, and give me courage against all the assaults and temptations of my enemies, that I may not be overcome and separated from You, my God and greatest Good. Amen. Come and fill me, O Blessed Spirit of Knowledge, and grant that I may perceive the will of the Father in all things, in every moment of every day. Give me an awareness of the pointlessness of earthly things and the ugliness of unholy desires, that I may stay pure in all my decisions and use the things of this world only if they bring You glory. Tell me what I need to know for my salvation and for the service of others. Amen. Come and fill me, O Blessed Spirit of Piety. Possess my heart. Purify me. Humble me. Enkindle in me such a love for God that I may be satisfied only in His service and lovingly submit to all legitimate authority for the sake of Your kingdom. Make me increasingly uncomfortable with everything that is evil, so that I turn away from it and live only in You. Amen. Come and fill me, O blessed Spirit of Holy Fear. Penetrate my inmost heart so that I may honor, obey and prefer You and my Lord Jesus and my Father God above all else. Help me to despise all things that offend You, and make me worthy to appear before the pure eyes of Your Divine Majesty in heaven, where You live and reign forever in the unity of the ever Blessed Trinity. Amen. Come and fill me, O Divine Spirit. Fill my heart with Your heavenly fruits: Your love for others, Your joy, Your peace, Your kindness, Your generosity, Your faithfulness, Your gentleness, and Your temperance for self-control, that I may never weary in the service of God. Keep me close to You so that my life produces Your fruits in ever-increasing abundance. Help me to continually and faithfully submit to Your divine inspiration so that I will be united eternally with You in the love of the Father and the Son. Amen.